Hope everyone had a fabulous weekend! 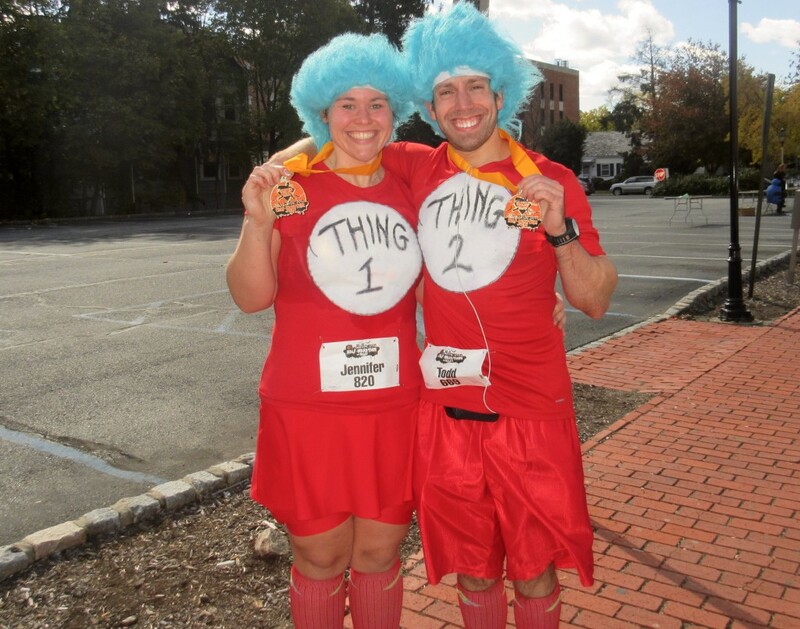 I thought I’d start the week off with a recap of the half marathon that Todd and I ran this weekend: the Halloween Half Marathon and Relay in Morristown, NJ! It was a brand new race hosted by Superhero Racing (though we have participated in other races hosted by this particular running club), and fact that it fell on this particular weekend meant that we could use it as the scheduled 12-miler on our training plan. 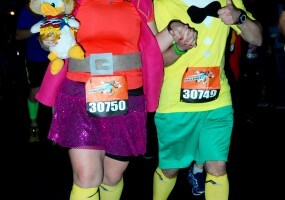 Running as minions for the Superhero Half Marathon last year! Because guess what? 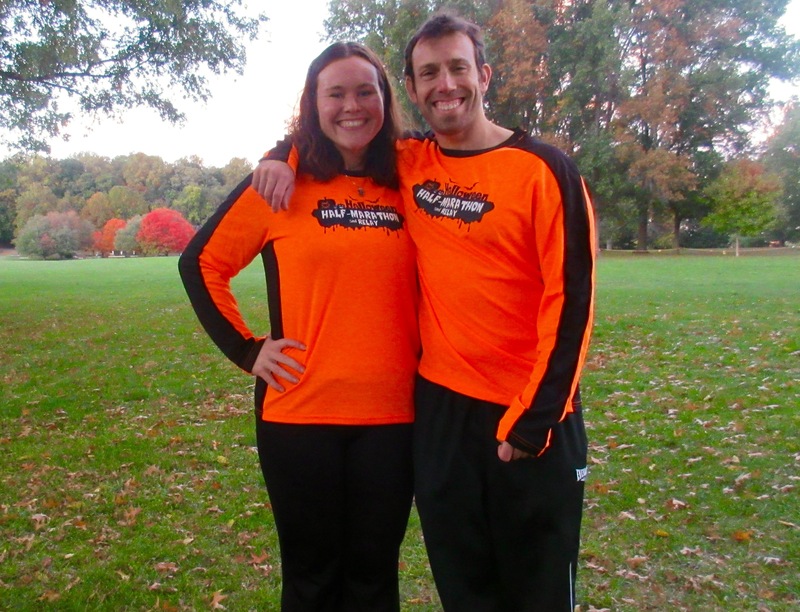 This weekend was our LAST DOUBLE-DIGIT LONG RUN until the New York City Marathon! I can’t believe we’re only two weeks away! It was a smallish (about 1,800 runners) local race that ran through Morristown and a few surrounding areas. I went to college in the area, and my first magazine job was based in Morristown, so I always like going back for a visit. 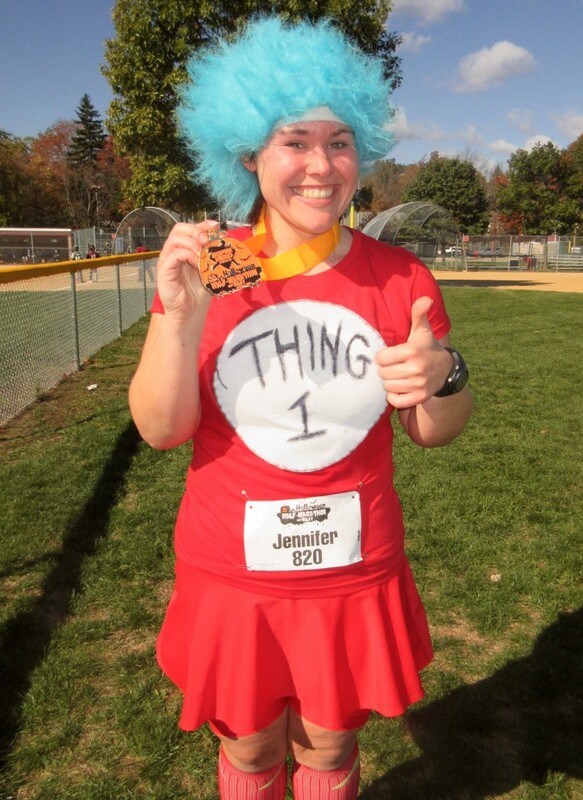 Plus, the race was advertised as a Halloween-themed race, with a Halloween medal and a costume contest and zombies along the course, and — best of all — CANDY STOPS! In other news, the temperatures were in the 30s that morning, and would only be in the 40s by the time we finished. YES. I would get to run in downright COLD temperatures for the entire race. In fact, it felt downright FRIGID! This is the weather I’ve been waiting for, and I’m so glad its FINALLY here! 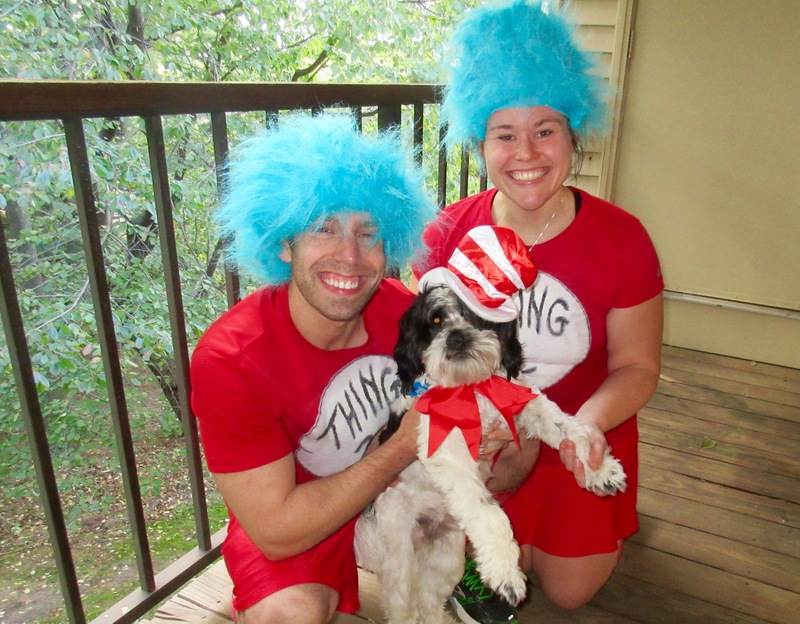 And, of course, it was yet another opportunity to dress up like a couple of idiots. 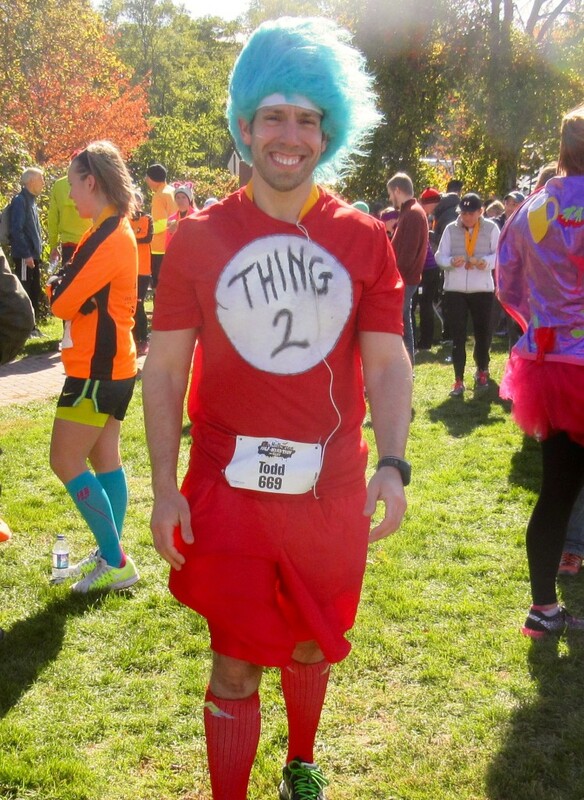 It WAS a Halloween race, after all, so I felt I had a perfectly legitimate excuse for costumed running! 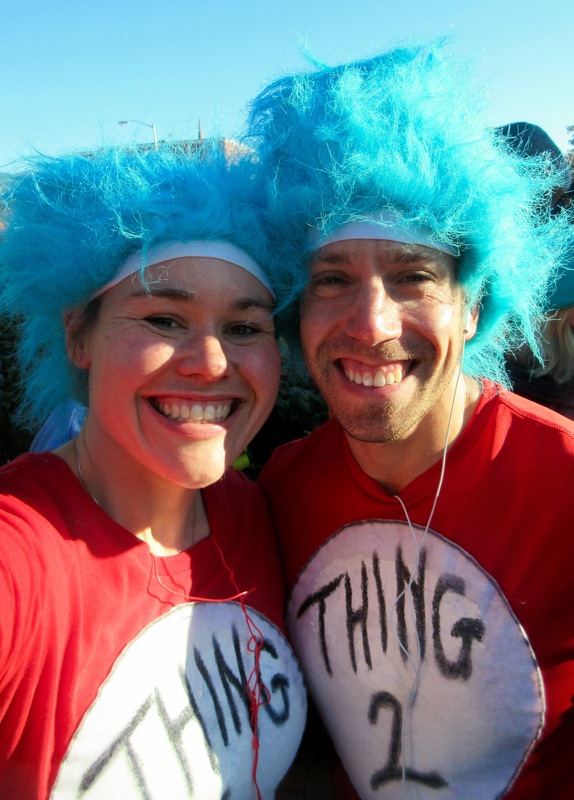 For this race, I thought we could go as a couple of my favorite mischievous characters from the world of Dr. Seuss. 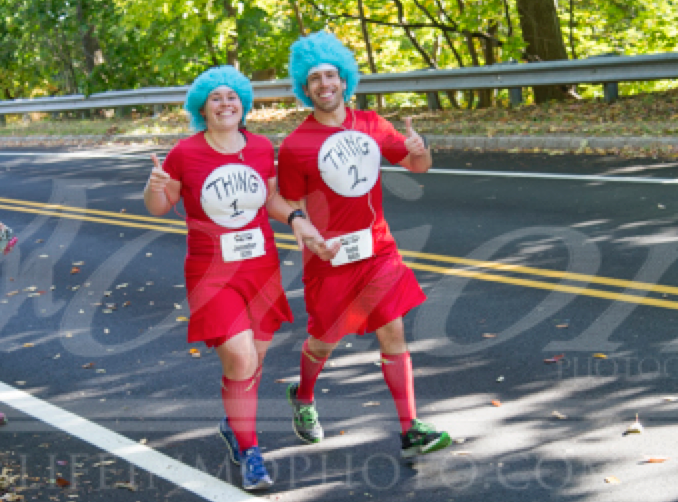 Yes, I actually convinced this guy to wear a freakin’ blue wig for a half marathon. Gotta love him, lol. 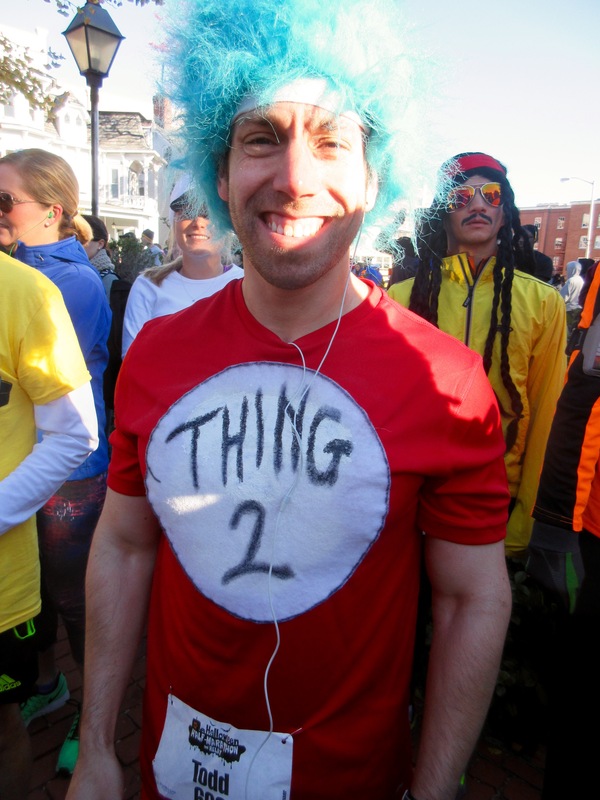 It was my first time wearing a wig for a race, and it actually wasn’t as bad as I thought! After a few mid-race adjustments, I finally got the damn thing to lay flat on my head, and the Bondiband underneath kept my new ‘do sufficiently dry, haha. The race started at 9am in a local parking lot, and as per usual, we just made it. Fortunately, there was a parking garage right across the street, and we had picked up our packets the day before, so we were ready to go! The goal for this race? To do the best we could. It definitely wasn’t going to be a hard effort — we’re saving that for November 1st! Plus, we conquered our 20-mile run last weekend, and truth be told, I don’t think my legs are fully recovered yet. We just thought it would be a fun way to cross another training run off the calendar. Needless to say, I didn’t have a time goal or anything; I just hoped to finish feeling strong and ready to run the full 26.2 in two weeks. I assumed we’d finish close to 2:30, which was our finish time in the recent Ocean City Half Marathon (granted, we ran 5 additional miles that morning and it was ridiculously windy, so I hoped we might do a little bit better this time around)! The course was residential, but it took us through a couple of different trails and local parks. The leaves are finally changing, and I got to enjoy some LOVELY fall foliage. However, the course was NOT. FLAT. We were climbing rolling hills the entire way, and as much as I wanted to complain, the fact that I wasn’t dropping dead and I kept running up said hills made me feel pretty confident about conquering the bridges in NYC next month. I knew there were going to be about 7 water stops, some with Gatorade (a MUST for me), but frankly, I was just excited about the candy. Because, you know, I’m pretty much a six-year-old. As promised, many of the water stops had tables of Halloween candy to grab. 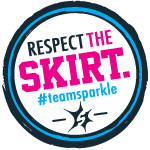 Let’s just say I put the massive pockets in my SparkleSkirt to good use that morning! There were parts of the course that were boring (we ran by what appeared to be an abandoned train track for a few miles), and there were others that I felt were actually pretty unsafe in terms of running on main roads with traffic. Another complaint? I only saw a handful of port-a-potties throughout the entire course, and that is a BIG no-no to me. But it didn’t really matter because as much as I tried to ignore my Garmin and just run by feel, I couldn’t help but notice that we were going way faster than I could have imagined. When I’m marathon training, I’m thrilled to sustain a 10-minute mile, and there were a couple of miles that we were finishing closer to 9:30! We discussed slowing down but we both felt good, and neither of us felt especially winded or anything like that…so we just decided to go with it. We were on the heels of the 2:15 pacer for much of the race, and in the second half, I decided that I was secretly going to race her to the finish line. It’s at this point in my marathon training where I’m usually EXHAUSTED and my legs hurt and I hate running and I’m sluggish and I’m freaking out about the race, and here I was casually running a half marathon at what felt like an effortless (yes, that’s right, I said it) 10ish-minute mile pace. Granted, the weather was perfect. Like, PERFECT. It was a little chilly at the start, but once we got going, I was perfectly comfortable. I knew then that struggling all summer was definitely paying off. I felt like I was flying; my legs felt good and it felt downright “easy” to sustain paces that I struggled to hit pretty much all summer. In those final miles, with my pockets full of candy and my legs still feeling pretty good (though not exactly “fresh”), I felt pretty freakin’ fantastic. This wasn’t going to be a half marathon PR or anything even close to it, but to be able to run the race so comfortably made me feel totally pumped about taking on NYCM in two weeks. We passed the 2:15 pacer for the last time somewhere in the final 5K, and that’s when I told Todd that we were definitely going to beat her to the finish line. I was feeling good and I thought that, FOR ONCE, I’d allow myself to be confident. 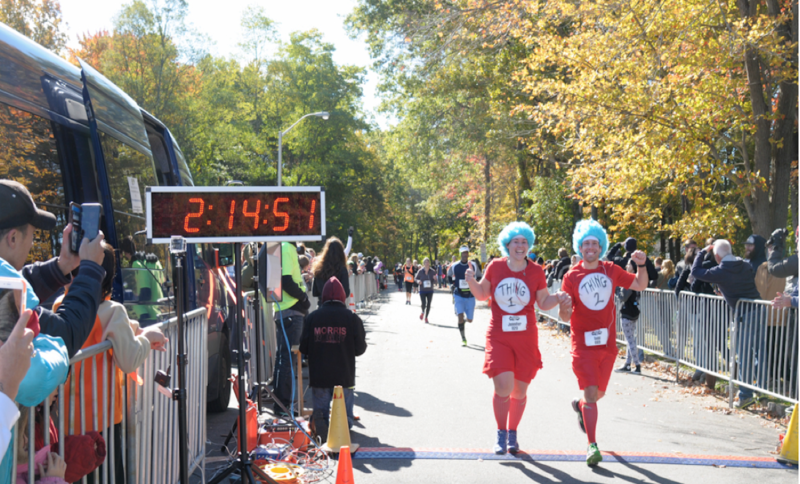 We rounded the final corner and headed to the finish line, which was set up in a park, with a bunch of people cheering us on (one race official even starting rhyming…”Thing 1 and Thing 2, you’re almost through!”) HAHAHA, love it. And, to my utter shock and amazement, we crossed the finish line with an official time of 2:13:41! We grabbed some post-race goodies (bananas, granola bars, water, etc.) and hung around for a few minutes to take some pictures (of course). Once my body temperature started to return to normal, I really started to feel the cold, so we decided to skip the costume contest this time around. The finish line area was pretty much mass chaos, and we didn’t even know when or if there would be an “official” contest. Neither of us really wanted to stick around very long. Buses were available to transport runners back to the starting line/parking area, so we were able to stay warm on the bus until we got back to the car. 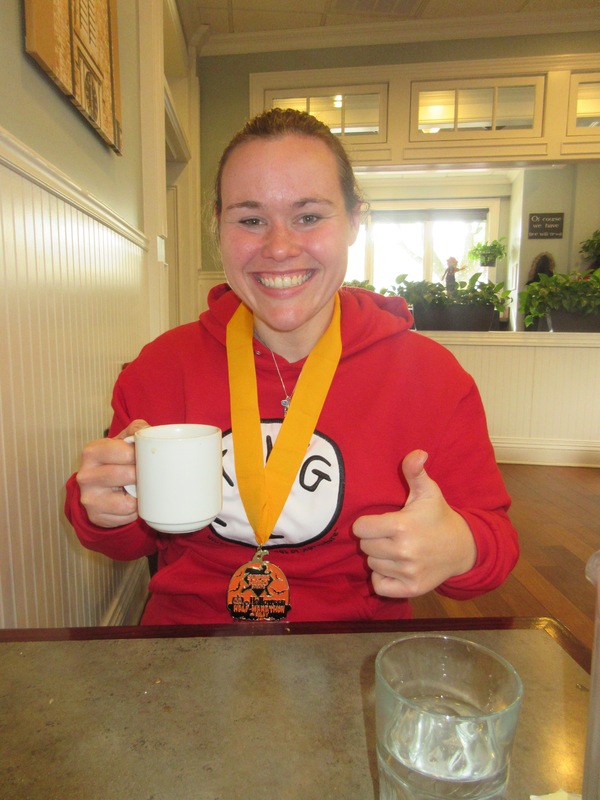 Then we proceeded directly to Turning Point so I could drink lots and lots of coffee and stuff my face refuel. We celebrated our half marathon finish (and kept our legs loose) with a walk in the park with our best buddy. 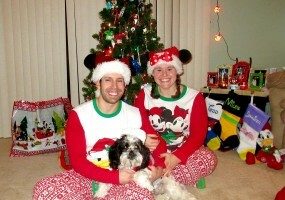 But not before subjecting him to this cruel and unusual torture. I’m sorry…but at the same time, I’m not sorry. I probably wouldn’t run this race again due to a few factors — e.g. the boring course, and the fact that we never actually saw any of the zombies they promised us! — but I was thrilled that we performed as well as we did. I think we both were pretty shocked by our results! 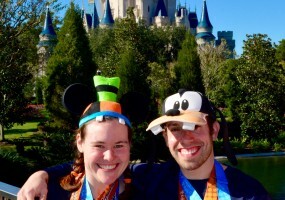 I’m really glad that we tackled our final long training run in a race environment. 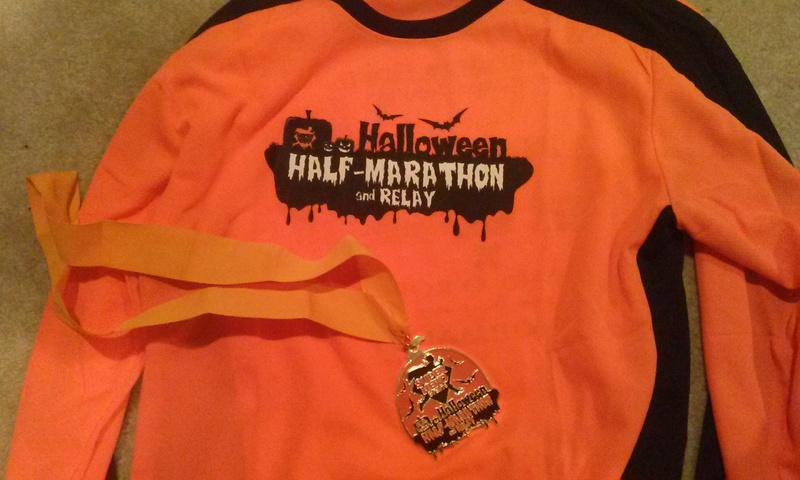 Honestly, the race wasn’t anything spectacular, but we did have fun…and the shirts and medals are super cute! I think completing our last long run as a half marathon forced me to recognize just how far I’ve come since I started training for NYCM this summer, and I am so happy to be going into the race feeling so confident this year! 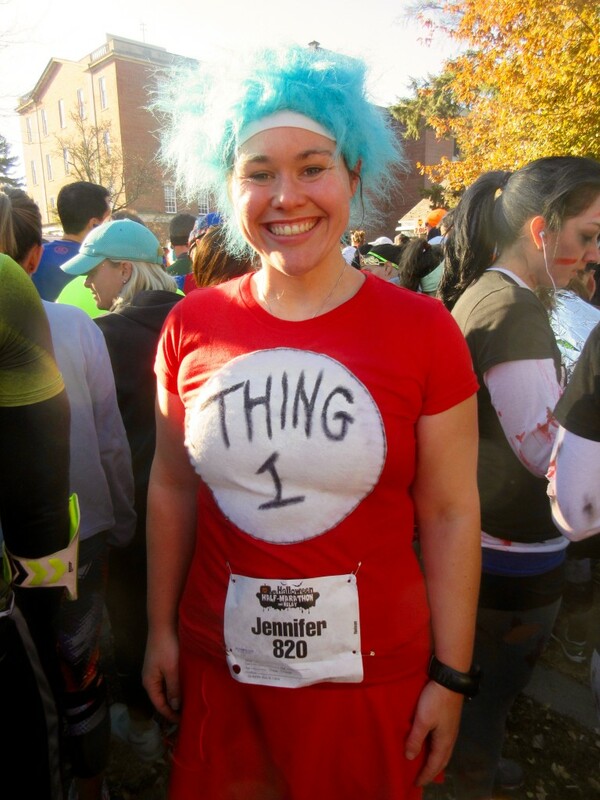 Have you ever run a Halloween-themed race? 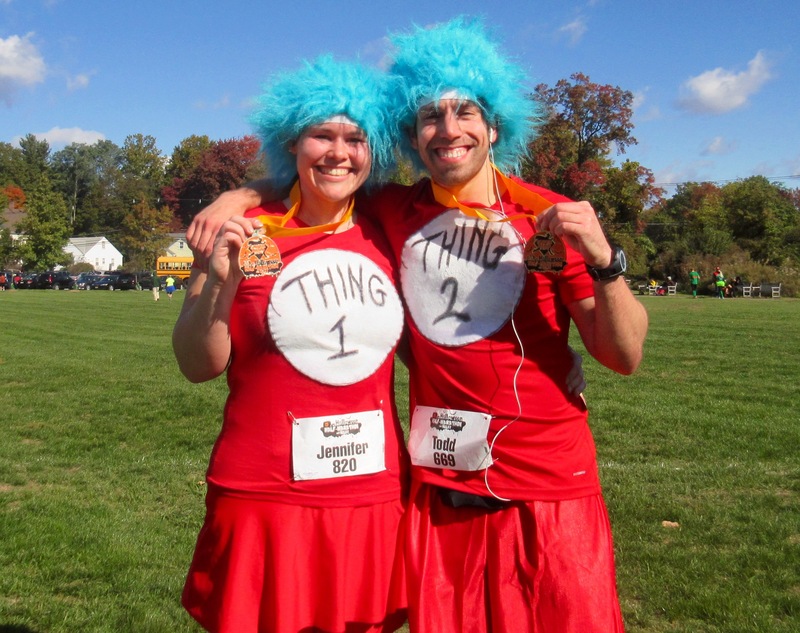 Have you ever run a half marathon as a training run? 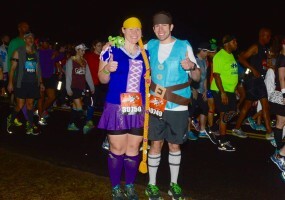 I love your running costumes! Great job on your race!! can we say #runnerenvy ? 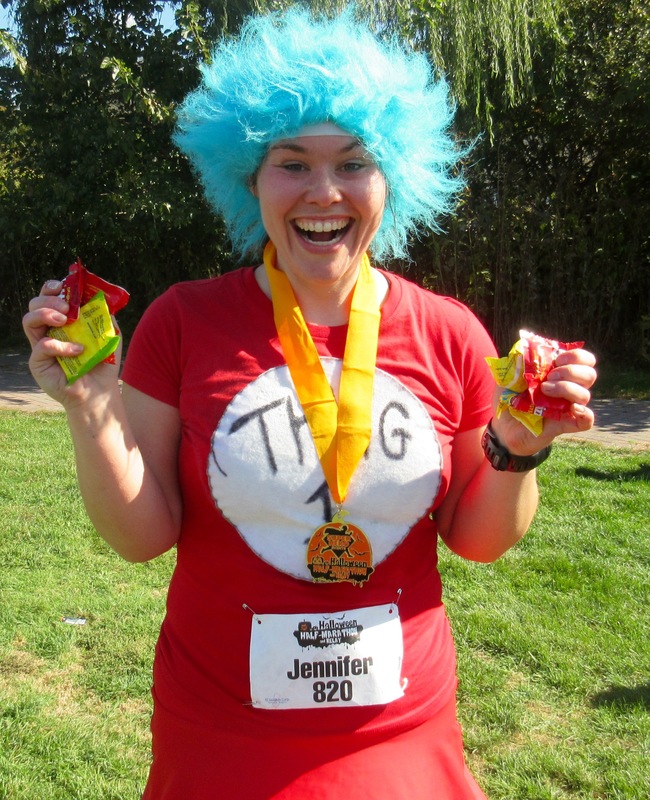 Perfect weather and candy, what a great race!!! Kudos to Todd for being a good sport and wearing the blue wig! Congrats to both of you on an awesome finish time! Thanks, Meranda! Definitely a fun experience, and he is a very, VERY good sport, given all of the ridiculous running costumes I ask him to wear, LOL. I can’t believe that weather, so COLD! Today everyone in Miami was complaining because it’s windy and 78 degrees lol! Thanks, Kristina! Oh, man…see, as much as I’d love to live closer to Disney, you’ve reminded me once again that I DEFINITELY belong in the North, LOL. Congrats on the better than expected race! I’m so glad you’re feeling confident about NYCM! Feeling confident is uber important for a race day. Mind over matter! (Unlilke me, MCM is 5 days away and I’m severely under prepared :/) Anyway, I’ll be in Queens with a sign so be on the lookout for me! Thanks, Kellie! I agree! 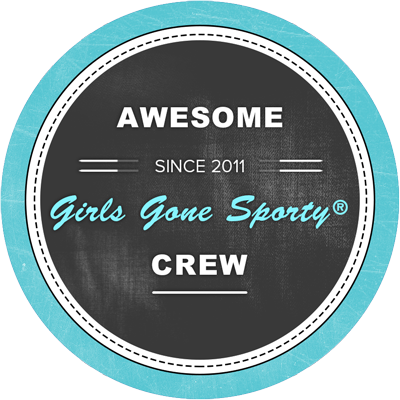 I’m sure you’ll be awesome at MCM — have an awesome race! I’ll definitely be looking for you, and hope to actually spot you this year! you had a fab race! I SO JEALOUS of the cool temps and am hoping for some in NYC next week! We gotta meet up before the race starts! Ugh, me too! I would LOOOOVE for those kind of temps for NYCM. Would totally love to meet up with you! OMG! The pic of you two running together is so cute! I love it! 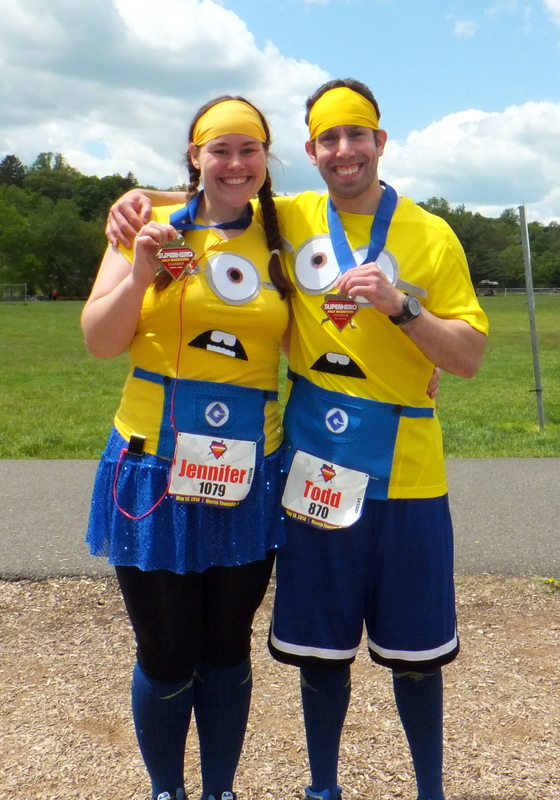 Your outfits are so funny….I love that you can get Todd to dress up for a race. 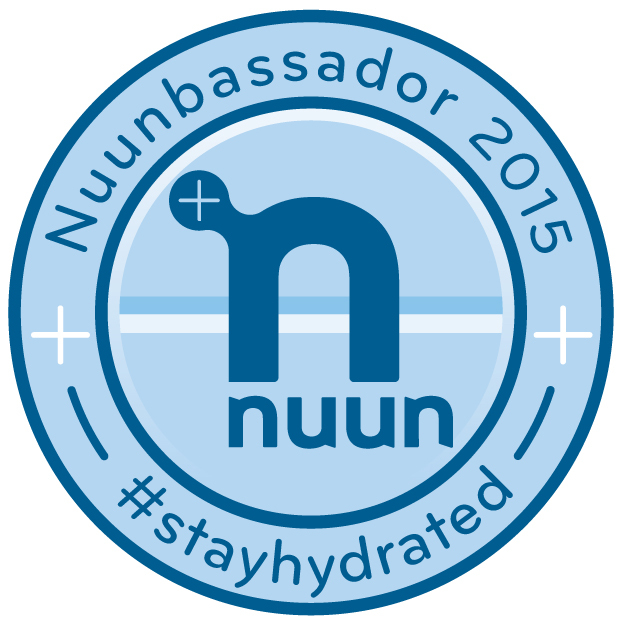 Congrats on doing so well at a half during marathon training. I am getting so nervous for NYC this week. Those bridges scare me. the human body as anintense weight lifter. decent exercise to make an unprecedented body. thatsteadily the proteins heals them up and once we workout it tears. which assists in improving musclelarger and consequently quickening thismethod that is recuperating and. Like girls guy are experiencing their particular difficulties to battle. appears. Then this will not be possible for you personally if be long to any discipline. Fortunately, there are several distinct ways by which you may get a body of your desires. and twofold theimpression of the exercise. of create your system being anintense weight lifter. significant exercise to create an exceptional body. with a faster pacewhen contrasted with all the regularmethod. whenever we work-out it holes. This action of tear and wear and afterwardchanging makes their muscle develop. is regaining andconsequently improving muscle larger and. taboo matter but generally folks don’t discuss such subjects. Nowadays, the low-embryonic cells are used to providethe skin with a amount of benefits. to stop agingindications for many years and infact, they have be realized. which are capable of protecting your skin from various kinds of damage. that is generally known as Derma Heavenly. the workout. It is Only extraordinary workout booster that providemuscle and the ideal wellness to you that you simply pine for. a decent workout to construct a fantastic body. 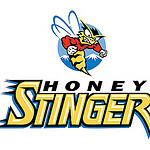 the standard treatment, the muscledevelop and utilize a speedierrate. A muscle develops wheneverwe workout it holes and after that slowly the meatsrepairs up them. produce. Thisproduct has frequent testosterone, which helps in quickening thisretrieving treatment andappropriately improving muscle higher and. As of late, the low-embryonic cells are used to supplythe skin with a variety of rewards. in a cellular-level, as it pertains towards the nourishment of the skin to your ideal extent. in the marketplace, which is known as Derma Divine. This piece of writing will assist the internet viewers for building up new blog or even a blog from start to end. É o melhor tempo para fazer planos para o futuro e é tempo para ser feliz. Tenho ler este post e se eu pudesse eu quer sugerir-lhe alguns coisas interessantes ou conselhos . Talvez poderia escrever próximos artigos referindo-se a este artigo. Eu desejam ler mais coisas nele! assunto, seu site veio, parece grande. Eu tenho bookmarked-lo em meus favoritos do google. Google, e encontrou que tem realmente informativo. Eu sou vai cuidado para Bruxelas. I’ll ser grato para aqueles quem continuar isto no futuro. Muitos outras pessoas provavelmente será beneficiou de seu escrevendo.